The Water Warriors Blazer (2005) is the same size and possess the same internals as the original Water Warriors Blazer by Buzz Bee Toys. However, its multiple nozzle selector was enhanced, offering a better assortment of nozzles to choose from. However, through stream behaviour is different, a model has yet to be tested here at iSoaker.com. Click to go to the original Blazer review. Nice feel, well balanced, tracked pump, and has a strap. Good sized firing chamber with CPS-like behaviour. Largest nozzle equivalent to a low-class CPS-blaster while the smallest nozzle allows for great water conservation and lengthy shot times. Pressure gauge a cute touch. Positioning of the pressure gauge switch activates it when not necessarily needed and can lead to hand strain/blistering after prolonged use. Opaque reservoir makes it difficult to determine water remaining. Trigger-grip area snug for those with larger hands. The Blazer is the water warrior’s equivalent to a Super Soaker CPS 1000 with less power more nozzles and longer shot time than most guns I’ve seen. It uses hydro- power which is CPS tech with a new name. The two reasons I would choose the blazer over the CPS 1000 is the wider selection of nozzles and the shot time. The reason I would choose the CPS 1000 over the blazer is power. Now for the stats. Pros: strap, shot time, nozzles. The Blazer is a small-medium-sized gun. It is only one inch longer than the Piranha, and just a little bit taller. But it packs a lot more in it. Smallest stream: I estimate this nozzle to be 1x or less. It is very small. I doubt it has much use, at least for me. But the shot time on this is amazing. This nozzle gets about 30-35 feet, which is considerable for such a small nozzle. Second-smallest stream: This nozzle is somewhere in the 1x-2x size, and it gets about 40 feet, which is very good range. This nozzle has a small amount of use in battle. I might find myself using it fairly often. Second-largest stream: This nozzle is about 2x-4x. It also gets about 40 feet. This nozzle, in my opinion, is the most useful nozzle, and is also my favorite. It has considerable output. It shoots for about 8 seconds. The stream is very constant. This nozzle also has that gushing-like sound that the Piranha’s largest nozzle also has. However, unlike the Piranha’s largest nozzle, this nozzle has nice range and stream consistency. Largest stream: This is the real drenching nozzle. I estimate it to be 5x-8x. It also has that gushing sound. However, it only gets a disappointing 25 feet of range. But I can see it being very useful in hit-and run attacks, where you run up, unload, and then run off. The stream is also not very consistent, experiencing considerable breakup. Spray nozzle: This is a fan-spray nozzle. It sends out a fan spray, much like that of the Monster series, but it is one big spray, rather than one of little holes. It has reasonable output, but not huge. But it covers the area very well. However, it does not shoot very far at all (maybe 10-15 feet). As well, on a windy day (like it was when I first used it) when shooting into the wind, you will find the water coming back on you. The pump is a thing I love about the Blazer. It is the best pump I have ever used, in my opinion. It is semi-tracked, making it very durable, but it pumps like a non-tracked pump, in fact easier than one. It takes around 20-30 pumps to fill, which is very reasonable. 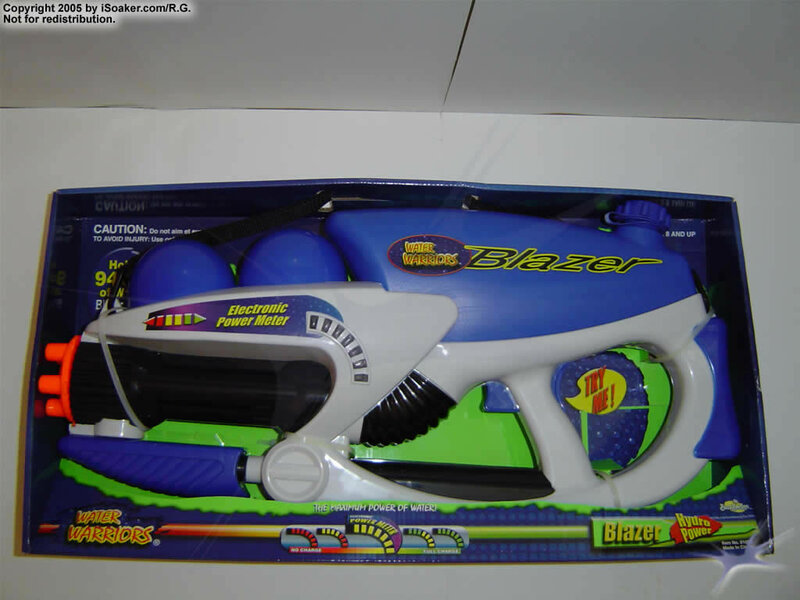 The Blazer uses Buzz Bee’s Toy’s Hydro Power, which is similar to CPS. This allows for very good stream power. The Blazer pressure chamber (PC) is VERY large. It is almost as large as the PC on my Super Soaker CPS 1700. The PC on the Blazer is bigger than the CPS 1200 (and 1000), CPS 2000 Mk. 2, CPS 2500, Monster 2001 (and CPS 4100), Monster X, and many other large Super Soaker. The large PC allows for extended shot times. But this also means you will get fewer shots per tank (about 2&½). The Blazer’s water tank holds a reasonable amount of water, about 2L. This is slightly smaller than the CPS 1200, and about the same as the Monster (2001) and the CPS 4100. Since the PC is so huge, I find myself wanting more water. But it is fine. However, the curved upper-shape of the tank makes it difficult to fill all the way. I find myself having to tilt the tank up in the air to fill it completely. The other problem is the color of the tank. While the blue tank looks (in my opinion) pretty good, the darkness of the tank makes it difficult to see the level of the water inside. So when I fill the tank, I often find the water overflowing and dripping down the body, causing me to have a poor grip due to the wetness. The trigger does its job, and smoothly at that. It feels durable, but only time will tell. Even though the shot times are often long, I do not find myself being annoyed at holding the trigger for so long. The Blazer employs use of an electronic pressure gauge. It takes 2AA batteries. The gauge is reasonably useful, but I do wish they had used a non-electronic gauge instead. Not only does the electronic gauge take up space in the body and increase weight, it also means that, eventually, you will have to replace the batteries, or get rechargeable ones. But I have not gotten to the most annoying part yet. The position of the button to activate the gauge is right behind the handle that houses the trigger to shoot. So this means whenever you are pumping, you will be activating the gauge, wasting batteries. The gauge button doesn’t feel too good on your hand, either. I believe I would prefer the Blazer to have no pressure gauge (I can handle having no gauge on my CPS 1700), and therefore no gauge button, than to have the gauge. Of course, I would prefer most of all to have a non-electronic gauge, such as that which is used on some Super Soakers. The Blazer has a handle on which you hold to pull the trigger, which also houses the pressure gauge. It also has a handle further back, which I assume is what you can hold when you are carrying the gun. But I use this handle further back to hold when I am pumping, as I do not want to activate the electronic pressure gauge, or be bugged by the button by which you activate it. But, when I am holding that handle, it gets slippery, making it harder to maintain a good grip. Remember, the tank overflowing caused this slipperiness, which was caused by the non-see-through tank. So I would suggest that the tank be a little more clear, and some gripping be added to the handle. The Blazer is very easy to hold. It weighs and holds like a much smaller gun, but performs like a lighter CPS. I would not hesitate to say that the Blazer can easily face a light CPS (such as the 1200, 2100, and 1000), and an experienced user can even face the CPS 1500/ 1700. This thing packs a lot for its size. Large PC gives you long shot times. Nice-sized water tank, on par with the CPS 4100. Five nozzle settings give you a lot of choices to choose from. Forty feet of range on the two middle stream nozzles is also very nice. The Blazer has the best pump I have ever used, being tracked, and yet at the same time smoother than any non-tracked pump. It is very light and small, and yet packs a large amount of power inside. Quite comfortable to hold, other than the pressure gauge button. Position of electronic pressure gauge means you will be constantly activating it, and irritating your hand. The gauge also uses batteries, an obvious downside. Dark tank means you can’t tell what level of water your tank is at while you are filling, causing the gun to become wet from overflowing as well giving poorer grip. Smallest nozzle too small, largest nozzle gets poor (25 foot) range. Fan spray nozzle doesn’t go far at all. Well, after cruising through the Kmart the other night, of coursei I stopped to see what they had. 4 Helixes and 4 Arctic Shocks. They didn't interest me as I already own a Vaporizor and AS (I'm like one of the only people who bought one ). I believe they also had a green Storm pistol. I looked at the Lightning and thought "Man, this things a beast!". Until I saw the Blazer, easily bigger than anything else on the shelves. Other than the Red/Black Scheme, these where Blue/White like the Arctic Shock. I bought it and took it home to read the iSoaker review before I test it. Mine has a Spray Nozzle while iSoaker's does not. I can only guess I had gotten a later variant. I filled it up, pumped it, the pressure meter works like it should, and on a medium nozzle I can shoot for some time. I haven't measured, but I am sure it is 40ft+. The smallest water conservation nozzle will let you shoot for a long time (very long time), how long I do not know. The next biggest nozzle doesn't last as long, but is alright for a small soak-fest. The medium nozzle is good for all around soaking of the enemy while conserving water. My personal favorite. The biggest nozzle doesn't seem to get much range, and almost shoots like the Flash Flood, although a lot longer. The spray nozzle is very good for up close or for spraying multiple people at once....or for watering plants. The pressure meter starts red and turns yellow and green as pressure builds up. I kept turning it on with my thumb on, so you must be careful not to drain the batteries. The cool factor on this will vary from user, I find it very cool. This soaker funtions like a CPS soaker, and can definatly hold it's own. I plan on getting the Lightning soon, and the strap is +1. I was impressed with the Blazer, if you can, go and get one.